Shirley L. Miller, 77, of Drake, Colo., formerly of Brush, Colo., passed away on March 1, 2019. Shirley was born Nov. 18, 1941, in Brush to Robert and Margaret Hunt. 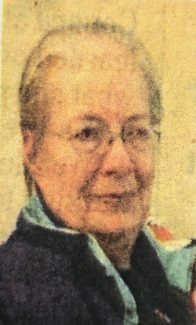 She graduated from Brush High School in 1959 and attended Colorado State University for one year. She married Bernard "Mo" Manheiser. They later divorced. Shirley went to court reporting school in Denver, working a little while as a court reporter. She also worked as a flagger for road construction and also drove a dirt packer. She worked for the Colorado Department of Transportation out of Hudson, Colo., for several years. Shirley married Richard "Rich" Miller on Nov. 3, 1985. She was a mother and grandmother and her grandchildren were her pride and joy. Shirley and Rich loved to go fishing and took the grandkids often. One of their favorite places was Alcova Reservoir in Alcova, Wyo. Shirley had a terrific sense of humor and always had some good jokes to tell. She loved living on the mountain up above Drake. After Rich's death in 2012, she had a wonderful support group of people on the mountain. She will be deeply missed. She is survived by her children Mark (Staci) Manheiser of Dacono, Colo., Cindy Lara of Casper, Wyo., and Rick (Mary) Miller of Casper. Grandchildren Myranda and Blake Manheiser, a sister Nancy (Dewain) Shapley of Stoneham, Colo., and a brother Russell (Barbara) Hunt of Jetmore, Kan.
She was preceded in death by her husband, Rich, and a daughter, Christie Canfield. Memorial contributions can be made to Big Thompson Canyon Volunteer Fire Department, PO Box 97, Drake, CO 80515. A memorial service will be held at a later date. To extend condolences to the family, go to Adamsoncares.com.